This post contains affiliate links. I earn a small commission from these links, at no cost to you. Hands down, my favorite review game is “Trash”ketball. I have fun every time my students play it and my students LOVE it. I’ve even had former students come by and ask me to teach their current teachers how to play it. I didn’t come up with this idea myself; I think it's been around awhile. I have played this game many times and have added my own spin and extra rules. First, you need a bunch of worksheets that practice the desired skill. I normally have 1-2 worksheets for each skill of the unit. The game works best if you have about 10 worksheets. The students will not get to all of the worksheets, that’s expected. When I play Trashketball, I typically make my own worksheets. They’re not pretty at all (sometimes it’s just photocopies of problems I have written on paper with a marker), but it doesn’t really matter. 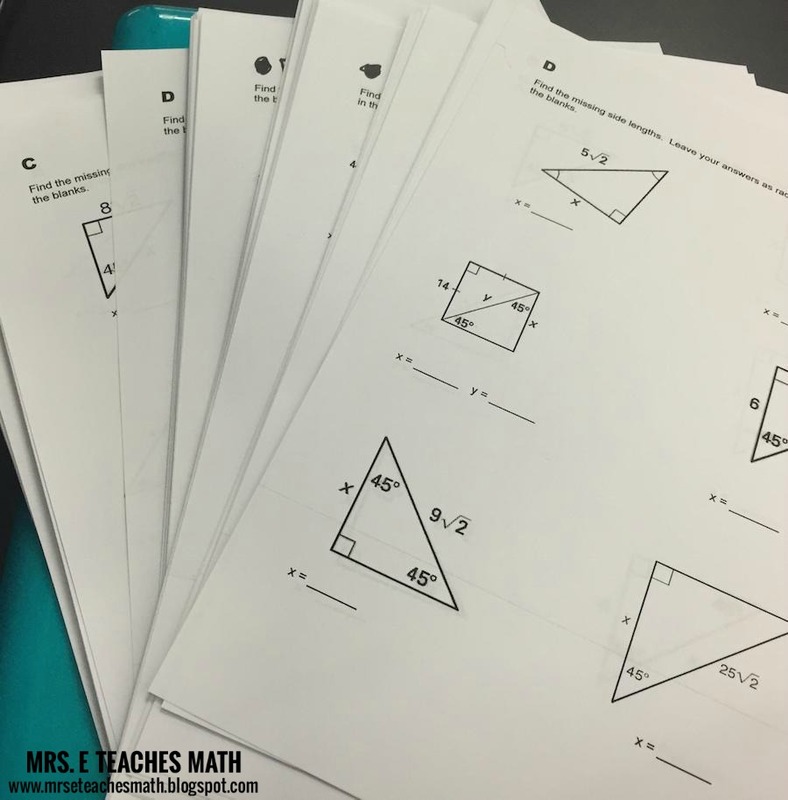 If you don’t want to make your own worksheets, there are multiple places online where you can get free worksheets (I like Kuta). Notice that all of the worksheets have a large letter at the top. This is so that you can quickly differentiate between worksheets. This game can get fast-paced, so details like this are important. Make a key for all of the worksheets. I usually draw blanks for the students to write their answers on; it makes checking much faster for me. Sometimes, I won’t check their individual answers, I just make them put the sum at the top of the page. I like to write my answers in marker and staple all of the keys together. I can check faster that way. Do whatever will be quickest for you. Make a zillion copies. Yes, this game is a MAJOR tree killer. That’s why I only play it a couple of times per year. I’m sure there are ways to go around this. Part of the allure of this game is that you get to throw wadded up paper. When you make your copies, make them collated. Then, when you pass out papers each student will get a different paper without any extra effort from you. I also like to print a roster of my students so that I can keep track of which students have completed which worksheets. I’ve found that this dramatically reduces cheating attempts, helps me keep an eye on students that may be struggling, and helps me identify superstars. This is totally optional. 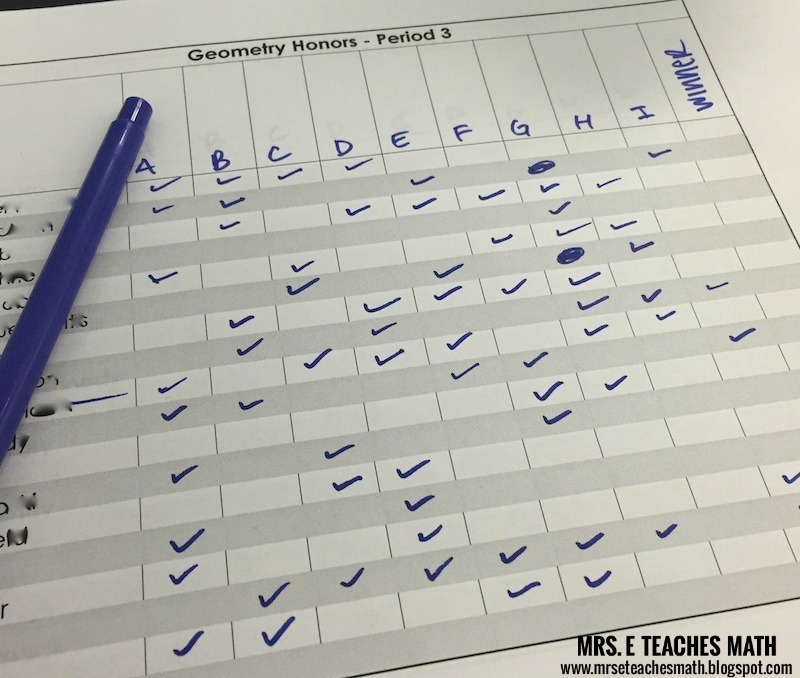 Pass out a worksheet to each student. Students will work on the worksheet. When they are finished, they will come to you to check it. Check the worksheet. I typically do not tell my students which problems that they missed, only how many problems they missed. If the student missed any questions, they go back to their seat to figure out where they went wrong. If the student is correct, they get to “shoot”. I make the students keep score themselves. I also tell them that if there is even an inkling of cheating, gameplay will stop immediately and the rest of the worksheets will be homework. I have smaller classes, so I usually do two teams and have them keep score on the whiteboard. One of the cool things about this game is that you can tweak the rules to fit whatever your students need. You can have your students work in partners or work alone. Students can be allowed to use their notes or have to do everything from memory. There is no one certain way to play this game. If you want to play, but don't want to kill a forest, this Nerf basketball set is pretty cool. 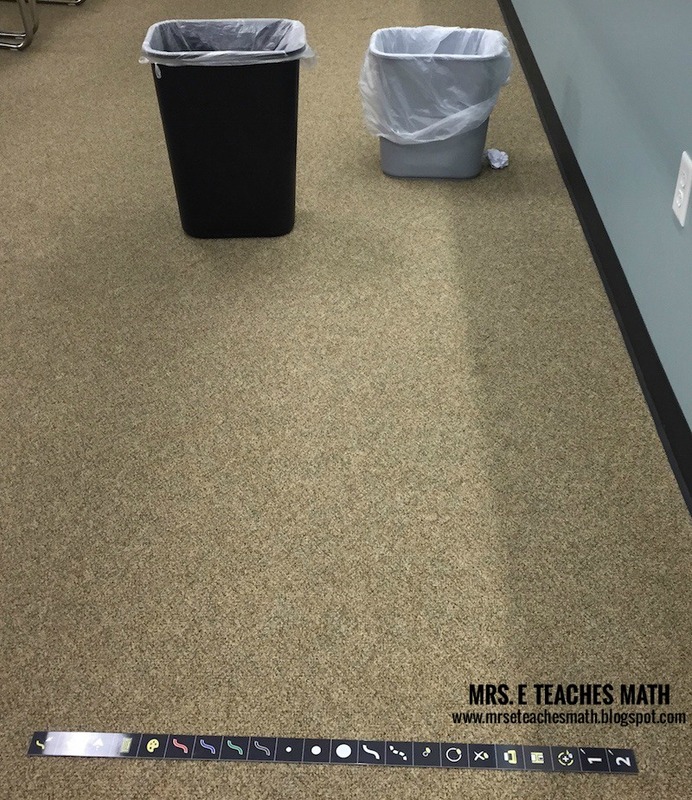 Students could work on whiteboards and shoot into the basket. I played this when my students were practicing special right triangles. You can download the worksheets that I used here and here. The answer key is not included. You should try this game; it’s a blast! Trix, how did it go? I love this game so much! This sounds great! How many attempts do they get at making the shot? After my students complete a worksheet, I give a grade, but do not return it. (Ss know what they missed- I check it in front of them, they self check as a class, or whatnot. If a students made several mistakes that most students did not make- I return the paper for them to correct. Otherwise, I do a quick -"Here are some common mistakes I noticed." I teach Spanish one, so a few mistakes are normal.) Anyway, I then place the paper back into the printer and use the other side. Student may end up with another student's work on the back, and sometimes they read the name, but there are not too many marks on them, and it's usually an old paper, so no one really cares too much. I also use columns and make mini practices on 1/4 of the sheet. It looks like you have just a few problems, so 1/4 sheets, and printing on both sides will make a big difference in a year. 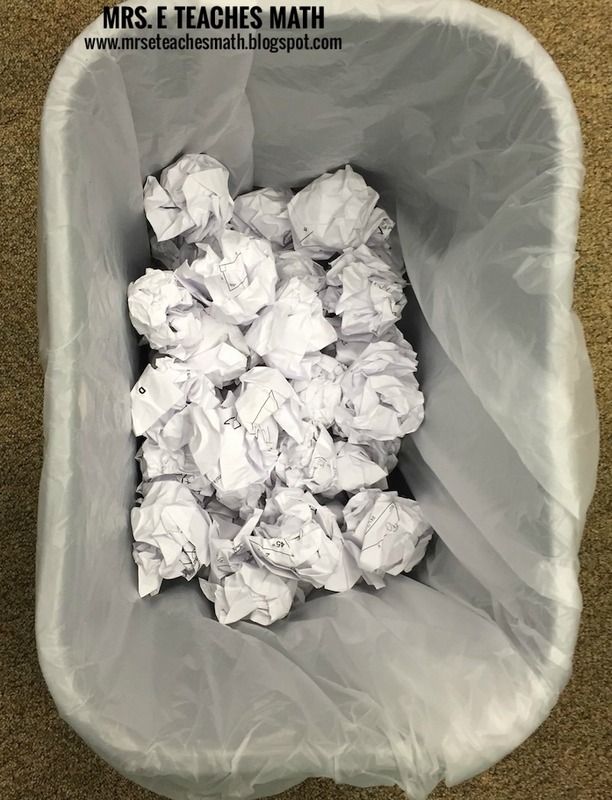 I don't feel guilty about not returning simple practice, b/c IMHO, students get off task/distracted when I pass back papers, and just recycle them right away anyway. Ss are aware of mistakes made when we check work as a class. Thanks for posting your game! This same game could be done by printing the worksheets on GOOS (good on one side paper). Then no paper would be wasted as it would go into the recycling! This is a great idea! I thought of a tree saving idea....just place the worksheets in sheet protectors and have the students write their answers on notebook paper. I can't wait to use this idea. Thanks for sharing! 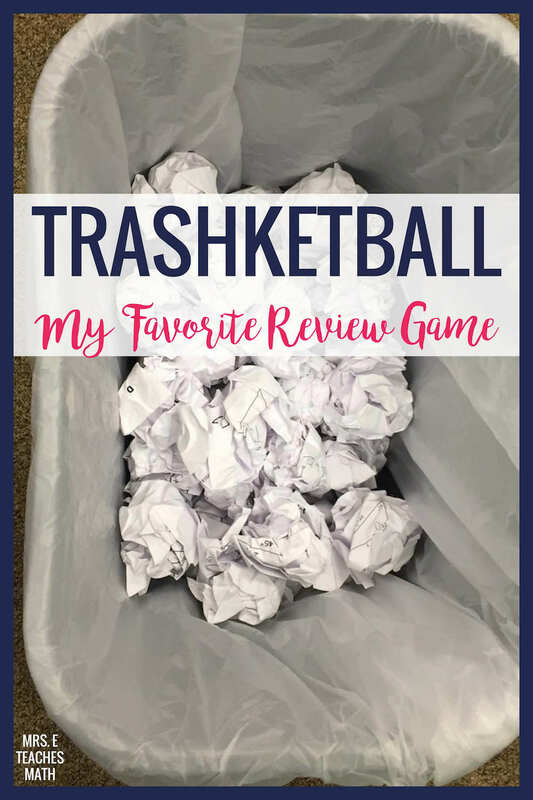 Perhaps a greener alternative could be having a box of balls that can be tossed, and then students can be required to accurately complete a certain number of task cards (3-5) before they get to shoot. I've also played this game reusing the same paper from recycling (have 2-4 "balls"). Two teams, each team gets a chance to answer a math fact (flashcards work great for this). If they answer correctly, they get a point (track score on whiteboard)and can shoot for an extra point. If answered incorrectly, the other team gets a chance to "steal" the point if they answer correctly AND make the basket. Hopefully that made sense...It's day 2 of my first year so my brain is fried! Love this game! I play this game with my students as well and they love it. My version is a little different, but I might try this way soon. Thanks! I would put papers in a sheet protector and use pile of scratch paper (extra copies) as the balls...that might help with the saving of some trees. :) Plus, it cleans out old copies at the end of the year, too! I collect scrap paper all year long and I cut the pieces in half. I now have a stack at least three inches high. During Trashketball, I put problems on the screen for them all to see. They solve in their groups on their scrap paper and then I chose a random person from each group to show me their answers. Correct answers get a point for each group and those few kids get to wad up their half-sheet and shoot. They can then gain 2 or 3 points for their group. Half the fun is in wadding up their paper. Non-shooters keep using their scrap paper until it is full or their get to shoot. Saves paper. I am a bit confused about how to determine the winners. 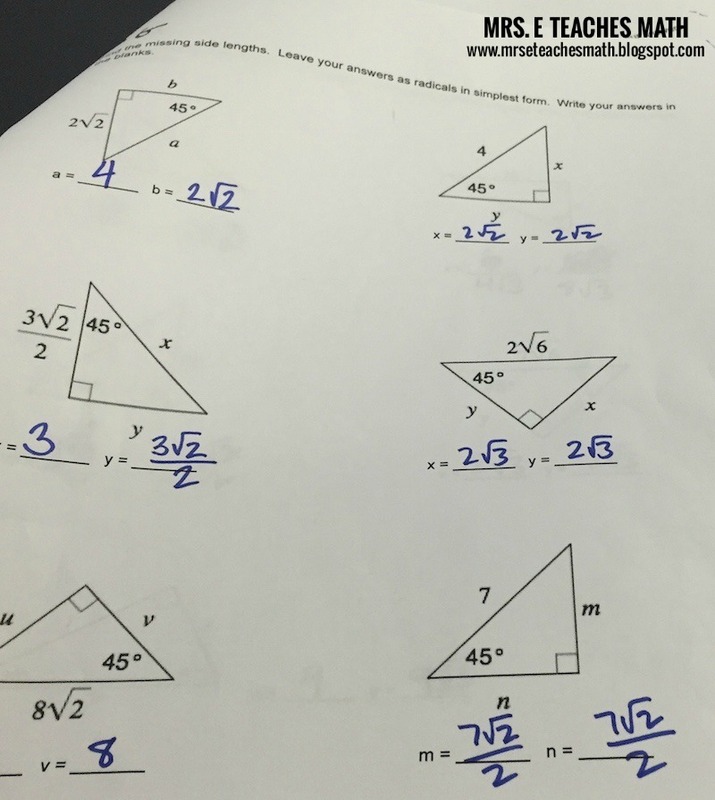 Will all students end up completing all worksheets? I understand the concept of giving the students points for their shots, and you stated that the students kept score, but how do the points determine who wins when the picture above shows student names and check marks with a "winner" column? This is my absolute favorite game to play at midterm and finals time. To alleviate extra copies, I give my students laminated problems, they write their answers (in marker) on any paper they can find in their binders, and I check them quickly. Students who are super organized often times notice that the "new" practice problems are the same as the papers in their binders. But I love that this game keeps them engaged AND cleans out all their papers at the same time! If you live near a Menard's, they sell great trashcans that look just like a basketball hoop! In our store it was less than $5.00. What do you do when a bunch of students end up going up to the trashcans at the same time? Do they just form a line? I just have them form a line. I can check pretty fast, so there typically isn't ever more than two or three. I also dock points if they are taking too long to shoot. The beauty? You can make up any rules to want to make it work in your room!